Living in a new country is an ever-changing experience, where every day brings new discoveries: culture, people, places, food as well as language. The first weeks can be fascinating but it always takes some more time in order to get used to your new environment. 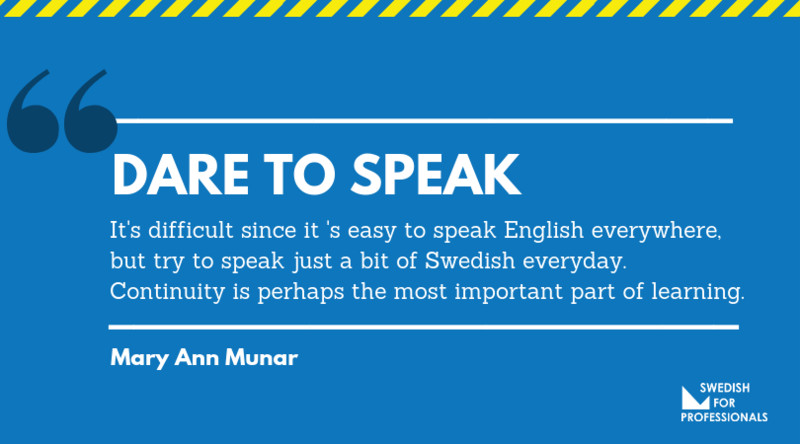 That’s why we decided to give you a glimpse of what it’s like to live in Sweden and learn Swedish through the eyes of our course participants! At the first interview of our series “Expat Stories”, please meet Mary Ann. Mary Ann comes from the Philippines, she is working at Hemfrid AB and she is learning Swedish with Swedish for Professionals. What was your first impression of the Swedish culture and people? Sweden is a beautiful country and its beautiful nature is one of my favorite things. In Sweden, you can find a beautifully balanced contrast where old historical buildings meet modern infrastructure, so you can have everything you have ever wished for. Furthermore, Swedes are very polite people. Everything is well organized and works fine. The transportation, the stores, and the banks have an efficient and simple way of working and dealing with their clients. Though nothing can always be perfect, so there are still problems or people who might not respect the laws. But my impression still remains the same and nothing can change the fact that I love and enjoy living in Sweden. What is your favorite thing about combing work with language learning? To be with my colleagues at the same time while learning Swedish. There is no stress, just a lot of talking and interesting conversations about work, different cultures and grammar. Also, it’s perfect for my work schedule as it is really flexible! How much do you feel that knowing Swedish has helped you to better integrate into society? It is really encouraging. The courses help me to get enough self-confidence to start speaking Swedish with my friends and colleagues something that I was feeling totally uncomfortable to try before. It also made me realize that learning the language is very important because it is useful both at work and everyday living. What has been your main challenge with learning the language? It has been quite difficult for me at the beginning until the moment I realized that learning Swedish is absolutely fun and interesting. Then I just wanted to learn more! Share a tip for everyone who is learning Swedish. “Dare to speak”! It’s difficult since it ‘s easy to speak English everywhere, but try to speak just a bit of Swedish everyday. Don’t give up because perhaps the most important part of learning is continuity! Share one of your favorite Swedish for Professionals moment. Fun! The trick, of course, is to have fun, something that Swedish for Professional’s language coaches do well. Discussing and exchanging ideas are some of their best ways of teaching the language inside the class.